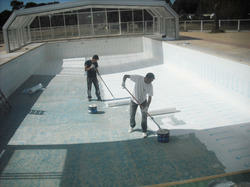 Miami Waterproofing is South Florida’s number one installer of high quality caulking and waterproofing systems. We specialize in hot and cold applied waterproofing coatings and membranes, as well as various high grade sealants for all types of exterior applications. Our highly skilled team is ready and willing to answer any questions you may have regarding your residential or commercial waterproofing needs. Whether it’s a garage or pool deck for a commercial building or a planter repair for a residential property, every job we do receives the same level of expertise and attention to detail. We firmly believe that each of our customers deserves the highest level of workmanship and customer service, this belief has led us to become one of the most trusted wateproofing contractors in all of South florida.